REGISTRATION HAS CLOSED FOR THE 2019 SHOW! IMPORTANT: DO NOT SUBMIT REGISTRATION FORMS FROM MOBILE DEVICES (payment will not load). Please use laptop or desktop computer. Information on requirements, cost, show numbers and solos is on the registration form. 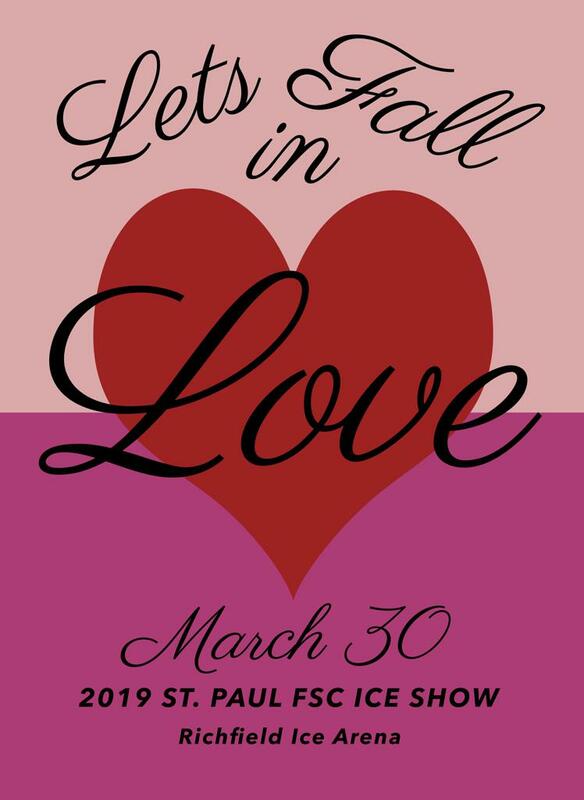 Contact Molly Oberstar, Ice Show Director, at spfscshowdirector@gmail.com with any questions. All club skaters who participate in the Winter and Spring Learn to Skate (Pleasant, Highland or Richfield), Academy or Preschool skate sessions or contract for Winter and Spring ice at Pleasant Arena are invited to skate in the annual St. Paul FSC - Richfield Ice Show! The ice show is a fun way to celebrate with friends and to make new ones. Show off skills learned throughout the year to family and friends in the audience. Come together to support the dreams of the skaters at SPFSC! Click here to view a gallery of images from previous years. Click here to view a video montage from 2017. Note that all participants must attend the dress rehearsal and both show performances, all held at Richfield Arena. Dress Rehearsal: Friday, March 29 at 5:30 pm. Please note: Some practices may not last the entire hour. Some groups may have some off-ice practices in addition to or instead of on-ice practices. Your group’s instructor will contact you if there are any changes to your child’s schedule. This year, ALL SHOW SKATERS are welcome to participate in the Parent/Child Number. Please view registration form for more information. If you choose to participate in the Parent/Child Number, the cost for ice time, coaching time and costume are not included in the registration fee and will be an additional cost. MUST ATTEND MINIMUM 2 PRACTICES + DRESS REHEARSAL TO PERFORM IN SHOW. Practice schedule for club skaters to be determined. Premier Sports Photos will be at Pleasant Arena the evening of FEBRUARY 21 to take group and individual photos of skaters participating in the ice show. Photos from this session will be used in the program, so it is important that you attend! Photo order forms will be available at the rink during the photo session. A detailed schedule will be announced as the date approaches. PRE-SALES FOR TICKETS END 3/25 AT MIDNIGHT! As a fundraising effort for the St. Paul Figure Skating Club, we ask that all persons attending the show, including parent chaperones of skaters in the show, purchase tickets to any show performance during which they will be in the building. Volunteers will receive complimentary admission for the performance(s) during which they are donating their time. Tickets purchased will be one-time use and valid for either show time. When in doubt, purchase adult tickets. Children and seniors will be granted admission with any ticket. However, we will not be able to accept a child or senior ticket for the admission of an adult. Pre-ordered tickets will be available at Richfield Arena "will call” during dress rehearsal and on show day. Pre-ordered tickets receive a $2 discount per ticket. Prices at the door will be $15 for Adult and $10 for Student/Senior. Volunteers are needed to help the ice show run smoothly. We are grateful for any time you can donate to SPFSC to make this production a success! Time slots are available on Picture Day (February 21), March 29 and March 18. PLEASE NOTE: Locker room chaperones must be Safe Sport compliant. For questions, please contact: Kelly Schnell at toddandkelly@msn.com or Dana Lossing at dana.lossing@parknicollet.com. Volunteers will receive complimentary admission for performances during which they are donating their time. Upon arrival to Richfield Arena, volunteers should report to main volunteer station to receive a lanyard to wear during shifts (designates complimentary admission).